Gayle Wilson, a community support worker from the Okanagan, submitted the best profile to the Community Social Services Matter website. Wilson won an iPad mini for her efforts. Through the cssmatters.ca website, frontline community social service workers can tell their stories about making a real difference in vulnerable people’s lives. Over 60 worker profiles have been published to date. Their stories are inspiring. On the cssmatters.ca, visitors can browse community social service worker profiles by job title and/or geographic region. You can read Wilson’s profile here. Frontline community social service workers are encouraged to continue submitting profiles. 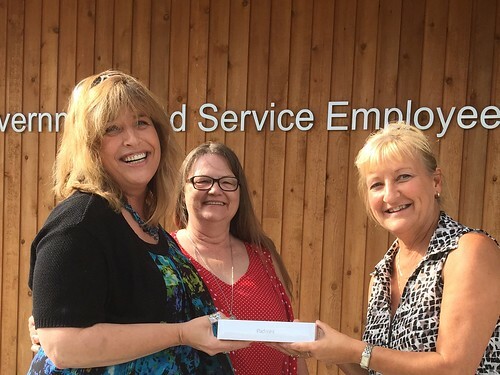 Pamela Pye handed Wilson her prize last week in Kelowna (see picture below). Pye is the Community Social Services’ component second representative to the BCGEU provincial executive. BCGEU established the Community Social Services Matter website in March, as part of Community Social Services Awareness month.